For more than two years, Ukraine has been outgunned battling Russian-backed rebels and Russian soldiers in the country’s east. Given that peace agreements have failed to end the conflict and Russia consistently lies about not helping rebels fight Ukrainian forces, should America give lethal weapons—specifically Javelin anti-tank missiles—to Kyiv? Arming countries is not a bad thing if it allows them to protect themselves against destabilizing forces. If Russia steamrolls Ukraine, there is nothing in Putin’s history to suggest that he would not continue onward because he feel no one will care. And international law fully justifies a country protecting itself. Sending lethal weapons to Ukraine would simply be supporting a sovereign nation to defend itself. And if you do not believe Europe is America’s business, keep in mind the NATO strikes against Serbia in 1999. The premise was that an unstable Kosovo and an ongoing conflict in the heart of Europe posed a national security risk for the west. A similar argument could be made for Ukraine, a much bigger nation situated on NATO’s border. Allowing chaos to fester is not smart policy. It is simply weak and shortsighted. Sending weapons to Ukraine is not a declaration of war against Russia. It is a commitment to Kyiv’s independence. And there is also some hypocrisy with Putin pushing back against arming the rebels. When he launched a brutal offensive against rebels in Chechnya in the early 2000s, he said he did so to defend Russia against terrorism. Why, then, can’t Ukraine defend itself from people they consider terrorists? Given that much of the fighting taking place in eastern Ukraine borders Russia, one would think Putin would want to end the conflict. Unless, of course, he believes he is benefitting somehow from seeing the violence in Ukraine continue indefinitely. There’s already been a lot of talk about the possibility, and as Senator John McCain pointed out to Trump, he has the authority as President to provide lethal weapons to Ukraine via the National Defense Authorization Act, which stipulates that the president can send upwards $350 million in military aid to Ukraine. During a recent visit to Kyiv, a former general in the Ukrainian army and a deputy minister in charge of bring peace to the conflict region both told me that their armed forces would benefit tremendously from having lethal weapons, particularly Javelin anti-tank missiles. They are particularly appealing in mid-range combat situations because they are very portable, lightweight and use infrared guidance to take out a target and allow the troops that fired it to take cover immediately. The Russian equipment in eastern Ukraine is some of the best they have. About 70 percent of Ukrainian anti-tank missiles are old or even expired. But almost all the Russian armor is reactive - that means boxes of explosives cover the tank, so when a missile hits a box it blows up the missile without harming the tank. The call for providing Ukraine lethal weapons has had support from both sides of the aisle since the war started in 2014. Former President Barack Obama resisted sending Ukraine lethal aid due to fears it would provoke Russia to further stir up even more trouble. But the reality is that the conflict is getting worse, even though no weapons have been sent. Trump is still accused of being in a weird bromance with Russian President Vladimir Putin, but he is so unpredictable that it is difficult to gauge, exactly, how his outlook will change over time. Between his envoy to the U.N. Nikki Haley saying sanctions will continue, and his assurance to Ukrainian opposition leader Yulia Tymoshenko of the same, Trump seems to be sending indirect signals that his White House’s stance on Putin is becoming tougher—even if it is not a direct condemnation of the Kremlin. If the concern is that Ukraine has not proven themselves to be a modern military, the next bet is to develop a “Train and Equip” program for Ukraine like the one the U.S. Army organized for the Georgian military in the early 2000s. The training provided Georgian troops with advanced weapons, surveillance and border patrol training. The caveat for that relationship was that soldiers were often deployed to Iraq after their training, which is pretty much the opposite of what the stated intent was of the program. 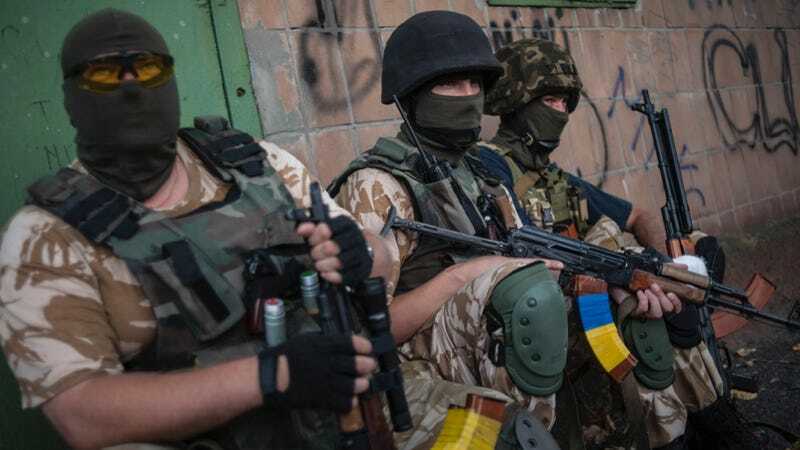 But, given that Ukraine has an active war in its own back yard, the program could be adjusted to simply train to protect their country instead of having to train under the guise of fighting global terror. “... arming Ukraine will only make things worse. It certainly will not enable Ukraine to defeat the far stronger Russian army; it will simply intensify the conflict and add to the suffering of the Ukrainian people. Nor is arming Ukraine likely to convince Putin to cave in and give Washington what it wants. Ukraine is historically linked to Russia, they are right next door to each other, Russian intelligence has long-standing links inside Ukraine’s own security institutions, and Russia is far stronger militarily. Even massive arms shipments from the United States won’t tip the balance in Kiev’s favor, and Moscow can always escalate if the fighting turns against the rebels, as it did last summer. Most importantly, Ukraine’s fate is much more important to Moscow than it is to us, which means that Putin and Russia will be willing to pay a bigger price to achieve their aims than we will. Moreover, one of Putin’s primary geopolitical tools is to create problems in conflict zones in former soviet states that want to leave his political orbit and freeze them. This is the case for South Ossetia and Abkhazia in Georgia, Transnistria in Moldova and currently Donbass in Ukraine. If the conflict in eastern Ukraine ends up like Georgia and Moldova, Putin will permanently host instability near NATO’s borders. And if Ukraine is beaten into a permanent state of near-collapse, then the world will need to start worrying about Putin’s next play. Maybe the Baltics.